Venice Night may be the best example of how technique can end to be delicate, refined. The material we used is MDF, embossed and laser-worked – or covered in wood. 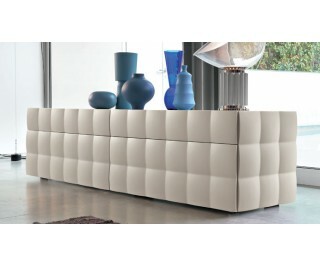 That creates a Capitonné effect and revives the rigid structure: it now has the looks of a soft pillow. Colors may vary from matt white, to black, beige, up to matt champagne. Starting from this year, a new version is available, maybe even more elegant and effective: a Canaletto walnut version, to give this innovative system a more classic look. Wooden or lacquered capitonnè 2 or 4 drawers chest, standard top in extraclear glass same colour as structure.